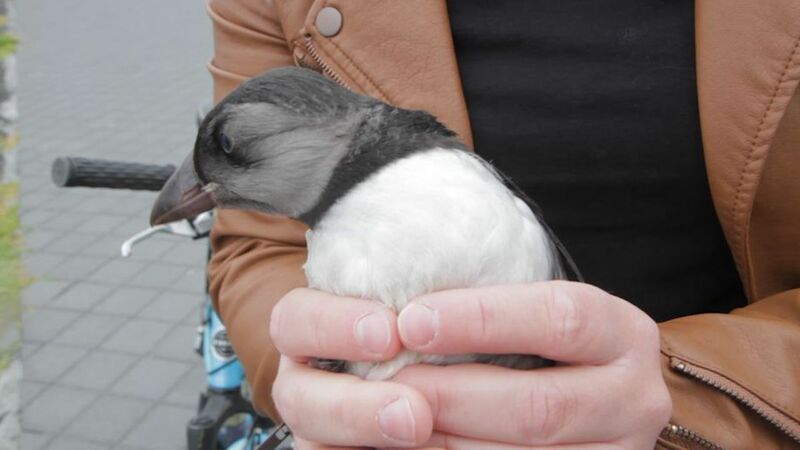 A puffling wandered into Skúlagata, a busy seaside street in the Reykjavik city centre last night. It's exremely rare to see pufflings in Reykjavik and this one was lucky enough to end up in the safe hands of SAR team member and Westman Islander Ármann Ragnar Ægisson who found it. Ægisson, who has years of experience in handling pufflings kept the little bird in his bathtub over night. "It's important not to release them into the sea straight away because at night they go back to land, seeking out the lights." Ægisson's girlfriend, Paulina Pierzak released the puffling at well known tourist spot, Sólfarið, a statue of a Viking boat at Sæbraut. Ægisson adds that pufflings cannot be kept as pets as they don't survive that.